Neil Young made a surprise guest appearance last night at Pearl Jam's concert at Toronto's Air Canada Centre. A 15-minute "Rockin' In The Free World" ensued. Neil is in town for the premiere of new Jonathan Demme film Neil Young Journeys at the Toronto Film Festival. What a weekend to be a Neil fan in Toronto! Vedder was alluding to Uncle Neil all night, but never in my wildest dreams did I think the big man would come out for the encore. Blew my mind. Also, the premiere of Neil Young Journeys tonight was amazing. Demme truly made a great film. So cool to see Neil driving through the city where I live, taking the same exit I do every day! There was an open Q&A with the audience afterwards and an old crush of Neil's from his early days revealed herself. Neil seemed genuinely shocked and extremely happy. A truly great moment shared between two people, albeit in front of 3000. Truly an unforgettable couple of days. Wow - yes he wrote the song but it is amazing how he instantly becomes the band leader when he has his guitar - as Briggs said in 'Shakey'. Is this the 1st time Neil has really rocked with a full electric band since Ben Keith passed last year? I saw "Neil Young Journeys" last night and it was a great experience. Neil, Peggy, Elliot, Jonathan Demme, Daniel Lanois and even Eddie Vedder were there. 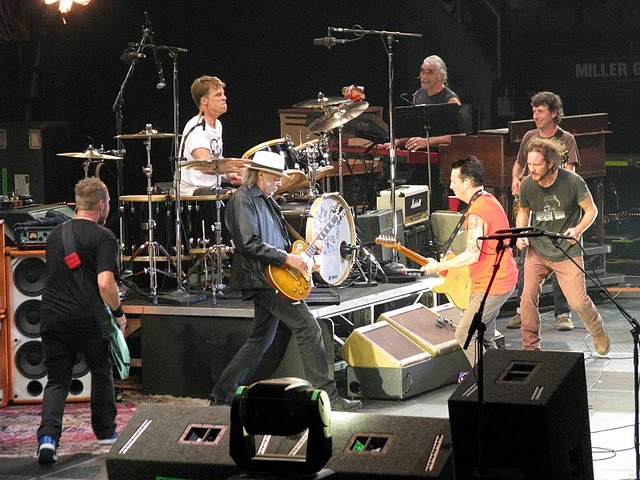 Vedder could only stay for the first few minutes of the show 'cause he had to go across town to play his own show. It was the first time a movie had ever been shown with 9.6kHz sound and Neil remarked that probably all movies will soon be shown that way "the Theatres just need to make some minor renovations..." to which everyone laughed. It was cool being in the theatre with the guy watching himself perform. I wonder how he felt about watching himself play "Ohio" with the video from Kent State playing over top of the song and all of us cheering when we heard the opening riff... That must be a very confusing/difficult feeling and Neil is probably one of the only people who will ever experience that. I was looking at PJ20 soundtrack on iTunes... It has Walk With Me from Bridge Benefit last year on it. 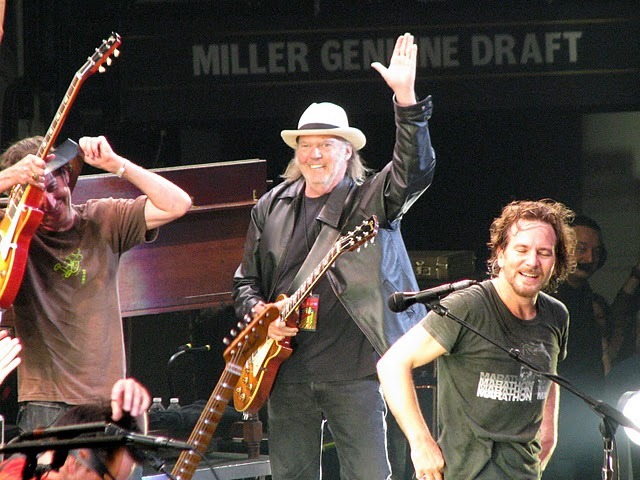 @Mother Nature...I couldn't tell you how thrilled I would be that Neil rocked out on one of my guitars....priceless! 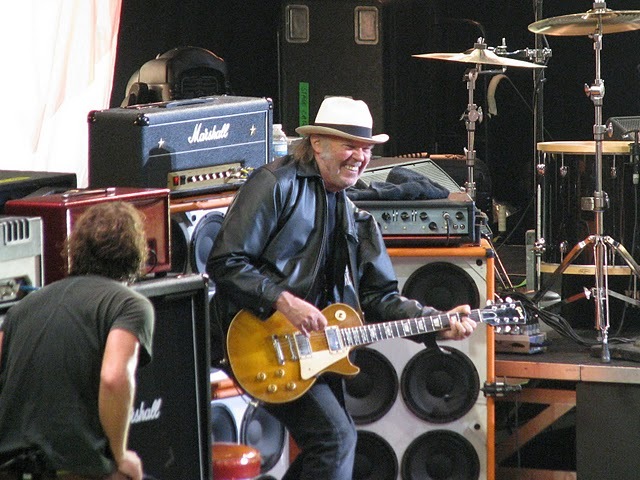 When Neil Young rocks out on anything it's priceless! Pass that popcorn over here, boys!